Wilbur Kinney of Port Charlotte, Fla. was aboard the carrier USS Yorktown when it was sunk by a Japanese submarine during the decisive Battle of Midway that began June 4, 1942. He was also serving on the carrier USS Block Island when it was torpedoed by a German sub on the night of June 29, 1944, in the Atlantic off the coast of Portugal. At the conclusion of the second World War, the 82-year-old Arcadia, Fla. native was serving aboard the carrier USS Bennington near Hiroshima when Lt. Co. Paul Tibbets dropped the first atomic bomb on that city from a B-29 bomber named for his mother, Enola Gay. “The worst part of the whole war for me was when I got picked, after the Battle of the Coral Sea, to collect body parts from 42 guys who were killed aboard the Yorktown. A 500-pound (Japanese) bomb went down to the fifth deck and exploded,” the old salt said. “They had to send some guys down to clean up the mess, and they picked one man from each gun. I was in a 5-inch gun crew and got picked. They gave us rubber gloves, but they didn’t have any nose masks. You would pick up body parts a while, and you’d throw up a while,” Kinney recalled. At 17, right out of boot camp, Kinney went aboard the Yorktown in Portsmouth, Va., after its guns were mounted. His battle station was “Shellman” on a 5-inch gun. He wore elbow-length asbestos gloves. He was responsible for getting the white-hot shell-casing from the gun over the side during the heat of battle. After reaching Honolulu, Hawaii, the Yorktown sailed with the carrier Lexington to a point off the coast of Guadalcanal. There the two American carriers were attacked by three Japanese carriers, which resulted in the Battle of the Coral Sea on May 7 and May 8, 1942. “We picked up the incoming Japanese planes on our radar. General quarters was sounded and the first thing they told us on the PA system was, ‘We’ve got 65 bogies approaching the ship!’ This was our first time in battle and it gave us a weird feeling,” he said. It was a partial victory for American carrier forces. It stopped the invasion of Port Mosby on New Guinea by Japanese troops. 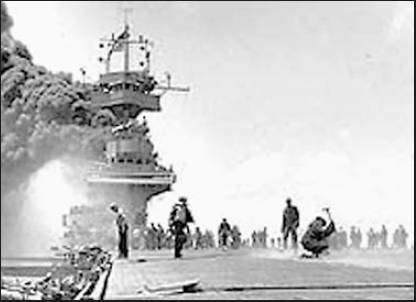 In addition, the American task force sunk one enemy carrier and put two more temporarily out of service. This would be critically important during the much more decisive American victory a month later at the Battle of Midway. The Japanese combined fleet, commanded by Adm. Isoroku Yomamoto, who had engineered the attack on Pearl Harbor six months earlier, was headed for Midway, a tiny atoll in the mid-Pacific. His plan: To force the U.S. Pacific Fleet to attack the much larger Japanese fleet and destroy the American ships. The American carriers knew the Japanese were coming and were waiting off Midway to spring their surprise attack on the enemy fleet. Initial attacks by American torpedo bombers were a disaster. They were followed by additional attacks on Akagi, Kaga and Soryu by bombers and dive bombers that knocked out three of the four Japanese main carriers in minutes. Haryu, the fourth enemy carrier, was spotted the next day by American planes and sent to the bottom, too. Midway represented the largest naval disaster in the Pacific war for the Japanese. Never again did the emperor’s forces go on the offensive during World War II. “I think the Enterprise, Hornet and Wasp comprised our main fleet at Midway. Since the Yorktown was damaged, they put her in the backup fleet,” Kinney said. The Japanese also had a backup fleet that attacked us while their main fleet attacked Midway Island. ” In the middle of the battle, one of the guys serving as lookout on the bridge got wounded. I was ordered from my gun position to be lookout because I had experience,” he said. “A few minutes later a (Japanese) plane dropped a 500-pound bomb down our stack and we had a hell of a list on us.” The Yorktown was dead in the water. Before the attack was over, the Yorktown sustained three bomb hits. She was in the process of being towed back to Midway by a seagoing tug when a Japanese sub attacked the carrier. It put a “fish” in the destroyer Hammond lashed to the Yorktown’s side that was supplying power, and a second one into the lower compartment of the carrier. When the enemy torpedo hit the destroyer, it cut it in half and both halves went to the bottom. When the destroyer went, all its depth charges blew up, killing most of the ship’s crew. Word was passed aboard the Yorktown to abandon ship. “I went over the fantail of the carrier in my life jacket into a sea of black oil. For 3 1/2 hours I swam around in 6 inches of oil and was finally picked up by an old World War I destroyer. When I got on the deck of the destroyer, there was a Marine with a first-aid kit that bandaged up my rather minor leg wound,” Kinney said. Eventually he was taken back to Pearl Harbor. In September 1942, Kinney reached San Francisco and was transferred to the converted tanker that became a jeep carrier, USS Block Island. She sailed the Atlantic as part of a hunter-killer sub group that included the carrier and four destroyer escorts. “We sunk 12 enemy submarines with our group. But at 8:20 p.m. on June 29, 1944, a German sub sunk us off the coast of Portugal in the Atlantic,” Kinney said. “The other three destroyer escorts jumped the sub right away and sunk it. Within 1 1/2 hours our carrier went down. “It was an eerie feeling going over the side on boarding nets and swimming around in oil and gas at night. The DEs turned on just enough light that we could swim to them in the distance,” he said. “There were 1,400 to 1,500 men in the water from the carrier and the DEs had to be very careful picking us up because they were overloaded with sailors from the Block Island. It was November 1944 when Kinney reached Norfolk, Va. 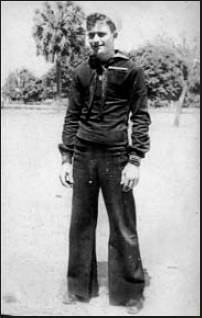 He thought for sure he would be given shore duty since he had served aboard two carriers that had been sunk. No such luck. After taking part in the Battle for Okinawa, the crew of the Bennington spent the next four months off the coast of Japan attacking the Japanese home islands with the ship’s air squadron. A few days after attacking Tokyo, the Bennington was off the coast of southern Japan with its carrier strike force pounding enemy installations. “I felt some kind of a concussion way off in the distance. I thought maybe an ammunition ship had been torpedoed and blew up,” Kinney said. “A few minutes later they announced aboard ship, ‘An atomic bomb has been dropped on Hiroshima.’ We wondered what the hell an atomic bomb was. We knew it had to be something big because we felt the blast, and we must have been 150 miles away. After sailing into Tokyo Bay aboard the Bennington, Chief Petty Officer Wilbur Kinney of Arcadia had enough points to go home. He transferred to the battleship Wisconsin and sailed for Pearl Harbor. At Pearl he went aboard the battleship Texas and sailed for the U.S. His war was over. In March of this year, Kinney received a call to report to VFW Post 5690, Port Charlotte, Fla. When he arrived the commander presented him with a large, bronze medal. Inscribed on the front of the medallion it read: “Our Grateful Islands Remembrance” and at the bottom: “Saipan and Tinian Islands 1944-1945.” In the center is a color guard carrying an American flag. 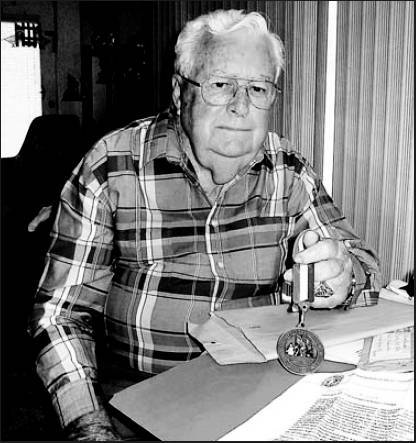 Wilbur H. Kinney was born on October 12, 1924 and died January 5, 2011. No further information was found. This story was first published in the Charlotte Sun newspaper, Port Charlotte, Florida on Monday, June 5, 2006 and is republished with permission. I continuously am grateful and amazed at stories like these. Thank you, Sir.